This is a mask (about 20" long) by Kyle. It is in the greenware stage--drying but not yet fired. Hopefully I will get a finished photo because we are going to use some glass and dripping glaze techniques to highlight the emotion he is portraying in the piece. Kyle has taken several Create in Clay classes and I think he is a very talented young man. What I love about teaching these classes is the creativity that they bring out in every one who takes them. 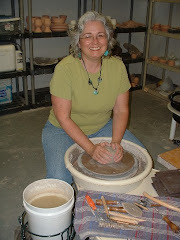 I think every person has a well of creativeness that they can tap into and clay is a great medium because it is not as intimidating as that piece of unmarked white paper or canvas. It practically begs you to touch it, mold it, make with it. Recently created stein like mugs for the Race for Rare event that took place on March 22. These pieces were extra mug bodies that I made at that time and decorated with my leaf pattern that I love so well. I can picture a large warm winter drink--spiced cider or hot tea/chocolate. I can also see a frothy brew refreshingly cold on a warming spring day. Detail, using an eye hook, bungee cord and a plastic pipe for a sleeve. This is the great idea that Debbie came up with to store the bulky bubble wrap I use for shipping. Now it is out of the way but accessible and rolls easily to tear off as many sheets as I need. Debbie helps organize the studio and this is an example of her handiness with tools! Thanks Debbie!! This is the unfinished pieces of the fish platters that I just posted. Forgot that they were on Facebook and not on the blog. Keeping the stories straight with so many places to put them is a job in itself. Photo sketch for texture of pots. Look at that subtle texture, the nubby chenille looking outgrowths, the silken bark and the more dry, lichen looking spots. Can't wait to try this! And this.......I just love the coloration changes and the beautiful banding. If you look very closely you can see a little honey bee at the bottom right of this photograph. This was taken at the San Diego Zoo, which had amazing animals and beautiful botanicals. If you would like to see more photos of the San Diego area, buzz over to my Bluegill Pottery Facebook page. They will be posting during March. A new, smaller size of my Bluegill Plates. This is about right for a bread roll, a soap dish, little cache pot. Gosh these were fun to make! These daffodils were planted about 20 years ago. They are my favorite flowers because they naturalize, are hardy and just make for a smile. They remind me of working in clay. One of the most asked questions is, "How long did it take to make that?" Like my daffodils, planted so many years ago, ideas have evolved and "naturalized" in my claywork. The short answer to the clay question is "as long as it takes to get it right". The true answer is "I'm not done with it yet--check back in another 20 years".